How does this work? Do you just make a building? Does it need a base? What dimensions should it be? Is there a list of criteria somewhere? I'm interested in doing something for this part while I have some free time. Standard Sized Buildings - These are going to make up a large portion of the city. Rather than type this several times since a lot of the dio team will be assigned one of these, I'll type it once here, and this is what I am referring too if I assign you a standard. These are going to be the bread and butter of the dio, so there is no need to get too fancy with them. They are going to be fairly simplistic structures that serve either as dwellings for poorer inhabitants, industrial type buildings, or storehouses, potentially even little shops. Size-wise these need to be between 6" x 8" and 8" x 10". They can be two stories if you'd like but one story is ideal. I'm not going to put too many constraints on the design; I'll leave that largely up to you guys, but don't go with anything too wild. 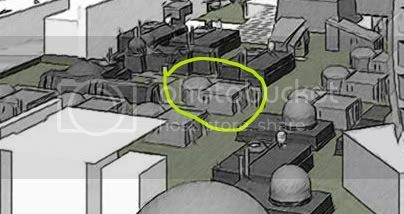 Look through the concept thread to get some ideas, or check out Tatooine type housing and imagine it grey. We want the buildings to have almost a primitive look, but with some obviously advanced technology subtly mixed in, to really give it a SW world type of feel. As for materials use what ever you are comfortable with, as long as the end result looks like concrete/stone. You can use my spray texture method, the stone fleck paint, or something else. We want a light grayish color for the buildings possibly with darker smooth steel mixed in. You can make these buildings partially open or give them open windows/doors, but if you do you are responsible for complete internal works, or at least as much as you can see inside, and you still need to finish by the deadline. Remember to try and keep these simple. Check with me if you want to do anything a little different with them. And please send me final measurements and whatnot as well. Also try and keep me apprised on your progress, ideally with WIP pictures. So we can make sure we are all headed in the same direction with this. Feel free to also look at my sample on page 5 of this thread for an idea of the color/texture we are shooting for. Small Market Stalls - As with the standard buildings these are something a lot of you will be assigned so I'll make a general post about it here too. These little guys are for the open-air market. There really are going to be very few restraints on these as they are meant to reflect the individualism of each of their vendors. That being said don't go wild and come up with something completely alien here either. These should be no bigger than 4.5" x 3", they can be smaller if you'd like. Most of these should be selling small little trinkets, fruits, vegetables, meats, etc. Kevin (Famine) is already taking care of a gun dealer so there isn't much need to have more than one in a small Imperial controlled space. The idea behind the market is that it is A) a place for residents to shop, much like Tatooines street vendors, B) it should be a great place to display a large crowd of customs, and C) With their size they should be relatively quick to build but will help take up a good amount of space. The vendor for you stall can either be inside or outside of the booth. Feel free to build them out of whatever material you'd like, while trying to take your vendor's personality into account. You don't need to make the vendor itself if you don't want but it would be great if you could. As with the Standard building be checking in with me on these to make sure we are on the same page. There shouldn't be any obvious base. Your building should be able to sit flat onto the city floor, which will be made up of stone tiles. You can leave the inside of your building hollow if there aren't any open windows/doors that would require an internal view. So really as long as the building sits flat you are fine. On page 5 of this thread I believe there is a good example of this. My building is just that, a building that sits flat and has no base. Brent's building on that same page however has a base, which was fine considering it was a sample and that wasn't against the rules at all for the samples. Now of course you need to let me know if you decide on a certain type you would like to do. I need to be able to add you to my lists. And when you decide on your exact dimensions send those to me as well, and make sure they are from the widest point on either side if your walls have any curves, pillars, drain pipes, etc. For the Market stalls you don't need to make the vendor, but the items being sold should be included. I think that should answer your questions, if not let me know, and I'll do what I can to answer them. And Greg, those concepts look great! Please keep in mind, I'm just trying to rough something together. So use your imagination a little bit! The final piece will reflect more straight lines (less nicks in the corner ). I plan to finish it with a textured flock spray paint. I'll follow it up with some dry brushing and adding approrpriate SW style technology and other finishing touches. This model is only about 6 inches deep. The final ones will be a bit longer. If people think this works in the basic sense, I'll plan on making around 6 in this basic layout (some subtle changes from model to model). The door and figure are there purely for reference. The door sample I have there has a little lip on it that causes the building to raise. It does sit flat right now. Also, I finished the cores of the other 4 trees. Here is a WIP shot of our little forest. Ryan, Do you think you'd want more trees than that?? building - looks very good. a row of these will look very cool together, like apartments. 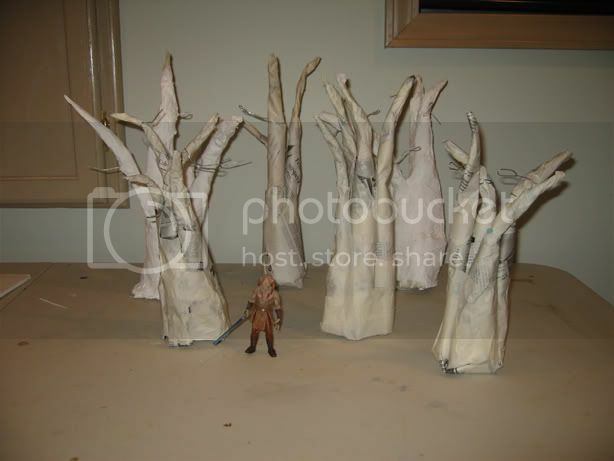 trees - now those are very cool, they will look awsome finished up with vegetation around them and figures. Brent, the savior of the UGP! Excellent work my friend... more and more is coming together, whoo hoo! 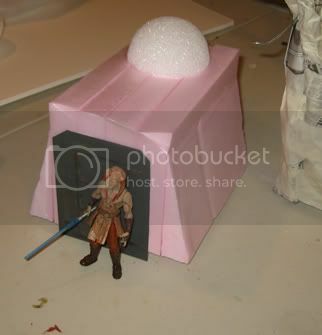 You did a great job with that insulation foam too, you are better at that than I am by a long shot! Quick update on my part for Wednesday, 4 April. 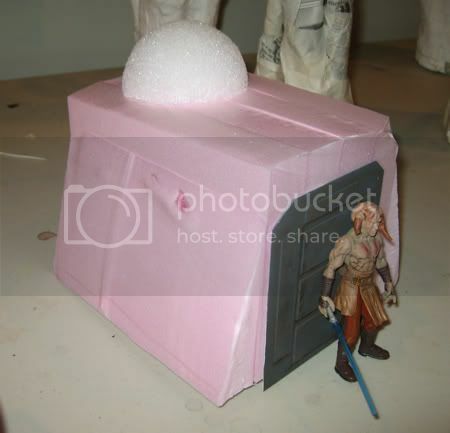 Roron's base: I have it templated out in MDF and Roron and I have discussed it via email. My wife and daughter are going to the big city on Saturday for 'chick day out' so me and my workshop will be in full swing. I am still tracking on mailing it to him on Monday for him to complete on his end. (pending final pic approvals on Sunday, hint..hint.. Roron, I will be pesty on Sunday). I have a post office 1/2 block from my work so sending it will be a snap. 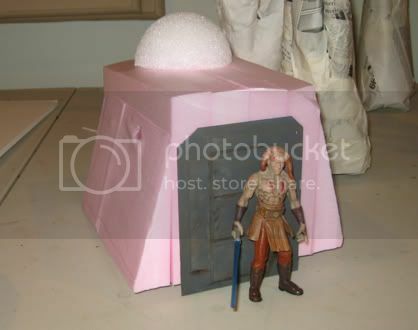 Palp Statue: Didn't get a chance to drop by Michael's today, but will make it tomorrow to pick up texture paint. I started sclupting a stone work look using 2 inch styrofoam. Will shoot you guys a pic midday Saturday to show you the rough look (much like BrentS did for his buildings) before finalizing it with texture paint effects. Another idea might be to use a wooden plaque for the base, just would need to be painted; if you want to simplify things for yourself any. Okay, I had to redirect my approach to the legs. My first attempt failed do to the weight they needed to hold up. Anyway, I started my new set and waiting on glue to dry, so I should be able to post some pictures tomorrow of at least one complete leg. Tried to stick with around the same set up as before, but instead opted for a thicker main support with one minor support. It also looks less cluttered than the first ones, so it has it's pluses. As for the paint, I'm going with a copper with a hammered texture. I didn't care for the chorme look and it showed major sanding lines which I couldn't fix. I should have that to show also tomorrow. One reason for the hammered texture is it covers up little flaws from my filling and sanding, and should cut out the need to weather. At least that is my hope. As for the wall, I got all 4 of my sections finished (not painted yet though)! Total length - 6 feet, 10 inches! 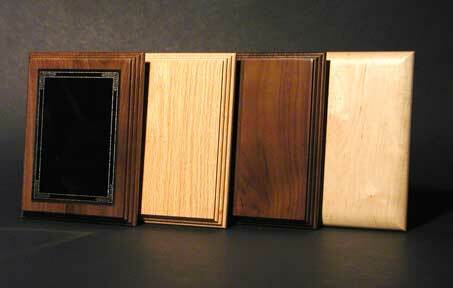 4 inches thick, and 8 inches tall. I am mailing it to Phruby tomorrow, the sucker weighs almost 20 pounds. Just thought I'd throw a few things out for reference here that could really good material for inspiration in making some things for the city. As usual, www.owenscustoms.com has shown some more awesome additions. Anybody who knows, what is best to use on this material for sturdy construction? Glue? What kind? I've got an idea for something similar to this and I may be able to 4-5 buildings if it works, but I want to try one before I commit. More rank and file, but I think the project probably needs that. Not everyone/thing needs to be "special" in my opinion. Also, is there any kind of cantina/night club yet? Wow! Owens work just blows me away. I might have to commission him for another project after he finishes my current custom.